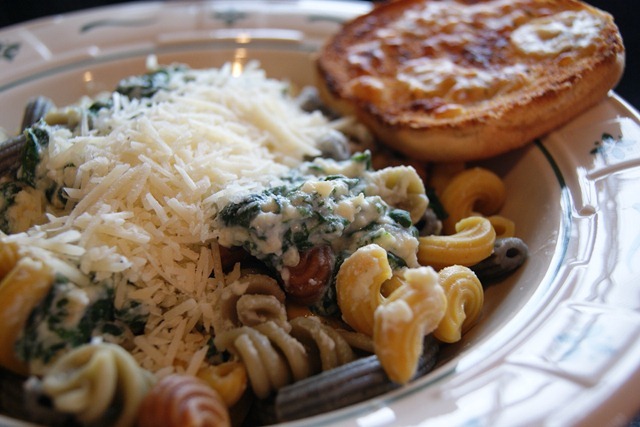 PASTA and SPINACH, I Love You! I love pasta. I love sauce on my pasta. And I love spinach in my pasta sauce. Spinach is so versatile. Who knew. This is a great change from the usual red tomato sauce. 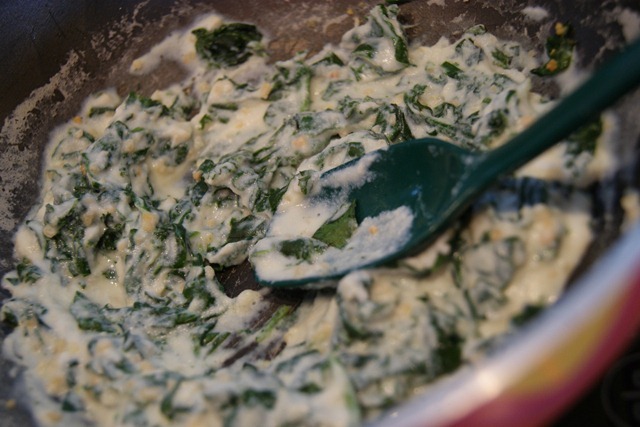 A creamy blend of garlic, spinach and ricotta, that is easy to make, tasty and filling! This dish is perfect for a quick evening meal. I think it may have taken me 10-15 minutes to make this. Perfect for my growling tummy. I used the Southwestern Blend of Pappardelle’s pasta. It included the flavors of blue corn, red southwestern chile, green jalapeno and yellow maize. I got this at our local farmers marker this past fall. 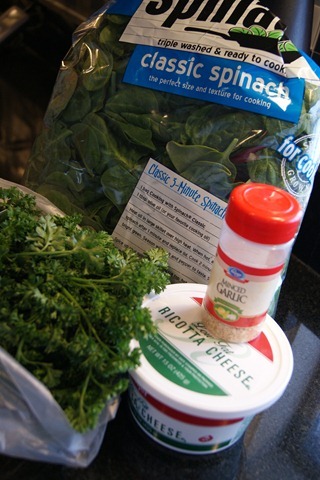 Plus some fresh spinach, parsley, ricotta and minced garlic. I sautéed the spinach in a drizzle of olive oil stove top. Add the sauce to the pasta and VOILA! 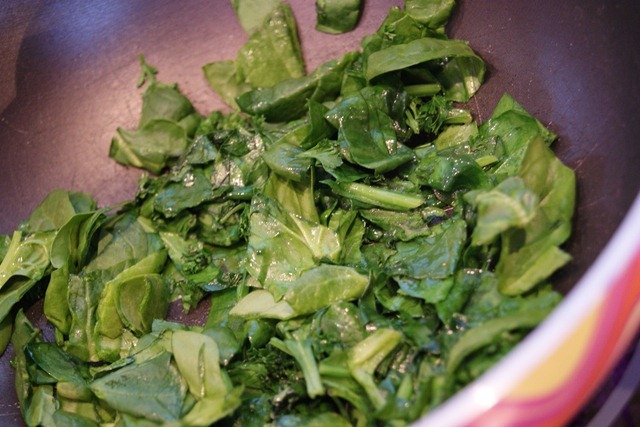 Sautee spinach stove top in the olive oil over medium heat until slightly wilted. Add in the garlic, ricotta and milk. Stir and heat thoroughly. Serve over the pasta shape of your choice. You made add in onion salt and pepper to the sauce if you desire. G, double O, D – GOOD!!! This was a delicious dinner in The Scene From Me household. Two thumbs up! Well 4, really. Do you like flavored pasta like I had here? I’ve heard there is chocolate pasta. Has anyone ever tried that? This entry was posted in Deliciousness and tagged dinner, Pasta. Bookmark the permalink. Oh I want to try the chocolate pasta! 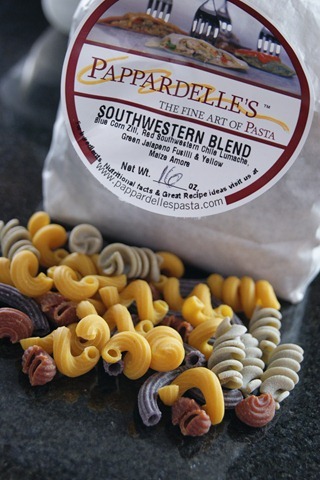 I got this flavorful pasta at the Binford farmers market in Indiana. 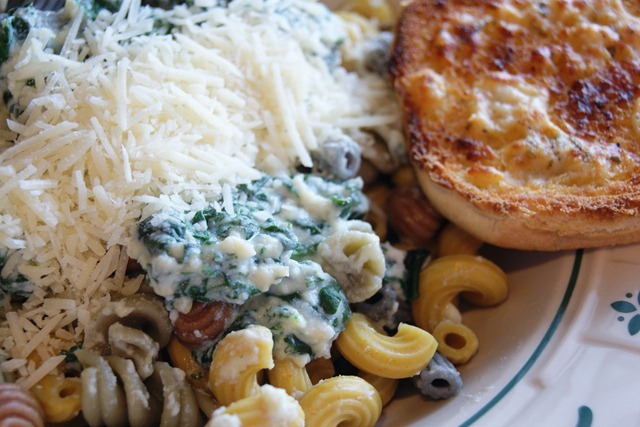 I’m so with you on spinach and pasta! You just can’t go wrong with that combo! The garlic bread on the side looks yummy too! Haven’t had GB is so long! This garlic bread is extra good because of the Cugino’s garlic bread spread that I put on top! 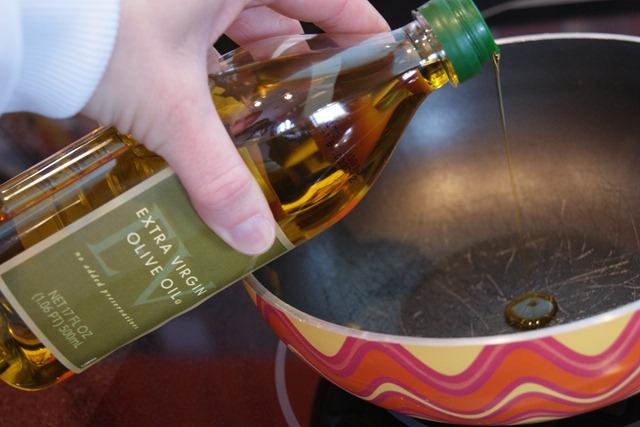 What a great way to make a rich, decadent sauce without heavy cream! Great job! i LOVE any kind of pasta!! this looks so delish. happy friday to you. Happy weekend to you Terri! I’ve never seen a pasta like this but I’m definitely going to be on the lookout for it now! Pasta is always a “go-to” recipe when I’m hungry and in a hurry so I love mixing up the toppings. I’ll have to try this!!! Kristen, you should go to the Binford Farmers Market when it opens this spring. That’s where they have all kinds of this pasta. Or you could order it online. I love the Binford farmers market! love the title! and so easy! kinda like a mixed up lasagna but without sauce! Thanks Lindsay, easy and delish! 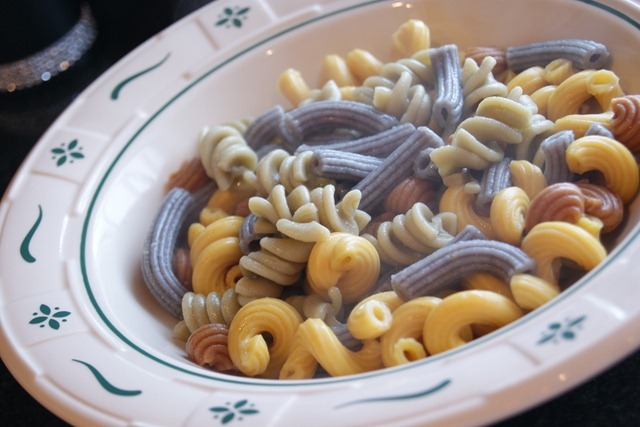 Mmm that looks so yummy–blue corn pasta? Sign me up! The pasta was delish. You can order it from their website which is in the picture of the pasta. Yummm that looks good. I’d probably do plain pasta, but the sauce….yes. Any kind of pasta would work. I used to have a pasta maker and make my own, but I like store bought so much better. I never had flavored pasta, that I am aware of?? I bet it is good. I normally buy brown rice pasta. That dish looks great. I would love to veganize it!! Omg. I’m dying. This looks so freakin’ good! Thank you Ryan, it’s making me hungry for it again too! 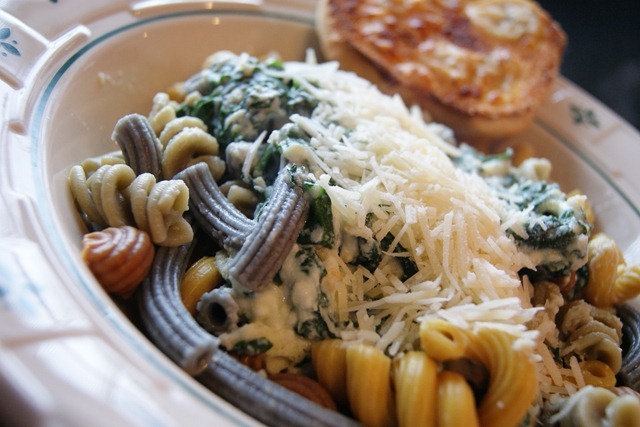 I love pasta and spinach too and this looks magnificent. This pasta sauce looks soo good!!! I’ve never had chocolate pasta, but I’d be willing to try it!! If you find chocolate pasta, let me know where! The pasta was delish and I wish I could find chocolate pasta! Oh good Kate, hope you like it as much as I do! That meal looks SUPER good!! Hope my comment worked? my comments have been going to spam lately! This looks incredible! I love flavored pasta but never had some that looked as tasty as yours. Oh… I did have rainbow bows once ;). They cost a fortune (for pasta) but I couldn’t resist :P.
I got mine at a farmers market. In the picture you can see the web address if you’d like to order some flavored pasta from them. sidenote- totally watch ps: i love you for the first time tonight! I cried like 15 times! so happy/sad/awesome/SAD! eep! I do love the movie too! Why not, it’s so good for ya! Yes, love loads of parmesan cheese on top! I like the pasta mix, I will have to look for that in my area! I’ve heard of black bean pasta but not chocolate, sounds kinda funky but I wont discriminate! 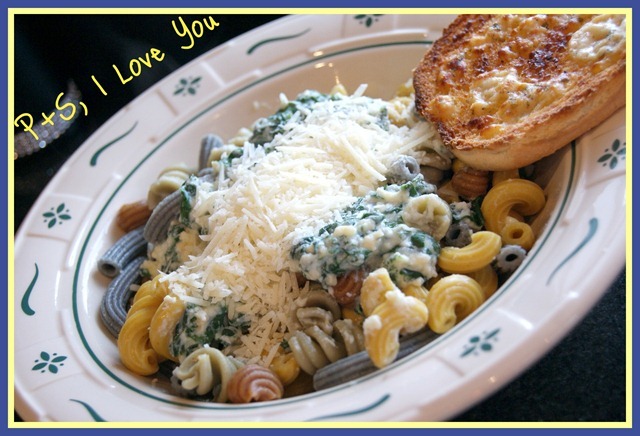 I love love love love spinach + pasta together. And add some cheese to the mix and you have a plate of heaven. I need to find chocolate pasta! I’ve never seen flavored pasta before! Chocolate pasta sounds interesting…and weird! 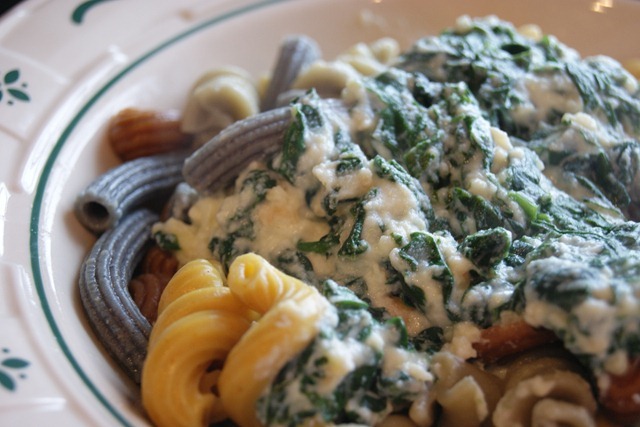 That creamy spinach looks amazing! I could eat it straight up! I could dip some bread in to that spinach sauce real easily! I am making this this weekend! YUM! I love your blog too!!! The mixed Pasta sounds good and it looks great too! And Spinach in a pasta sauce always makes a yummy dish! YUM!! This sounds so good I cant wait to try it!! Yummy! 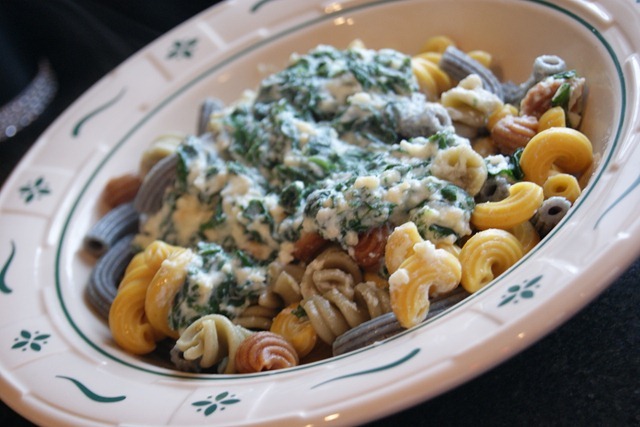 That looks delicious – way easier than my spinach and white sauce recipe. I’ll have to try it!